Please welcome a brand new sponsor for October Unprocessed: Primo Water! I’m also a fan of tap water, but tap water doesn’t taste good everywhere, and there are some places where the tap water may not be safe to drink long-term. Under-counter filters can help, but they too generate waste and don’t usually filter everything (most are just carbon filters that help with taste, but not safety). Home reverse osmosis filters are another option, but they’re quite expensive and require maintenance too. In contrast, Primo’s refillable 5-gallon jugs are reused up to 40 times before they’re ultimately recycled. That means each Primo bottle delivers roughly 1,500 times the amount of water than a single-serve bottle. 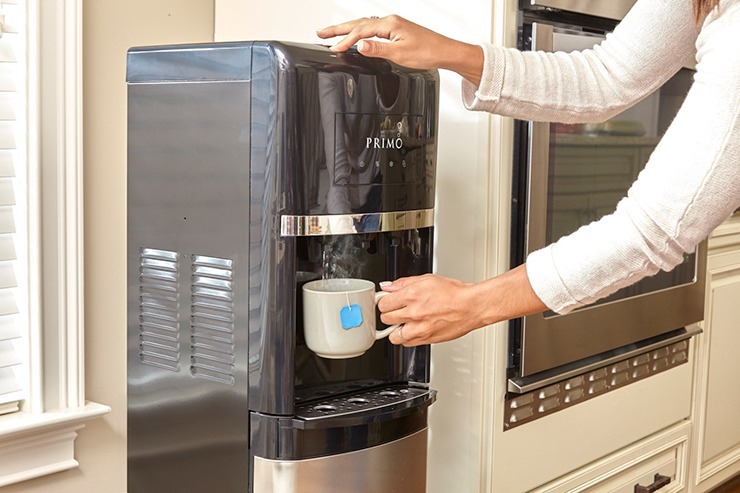 So if you’re drinking something other than straight tap water, then Primo is a great option – and definitely far, far better than single-serve plastic bottles. How does Primo work? You simply buy one or two pre-filled five-gallon jugs (at over 12,000 retail locations in the United States and Canada), and then once you’ve consumed all that water, you can either exchange the jug for another pre-filled one, or do a “self fill” at one of their 4,000 refill stations. Of course, it’s tricky to pour a glass of water directly out of a 5-gallon jug. That’s why Primo also sells a variety of dispensers. And that’s where our giveaway comes in. 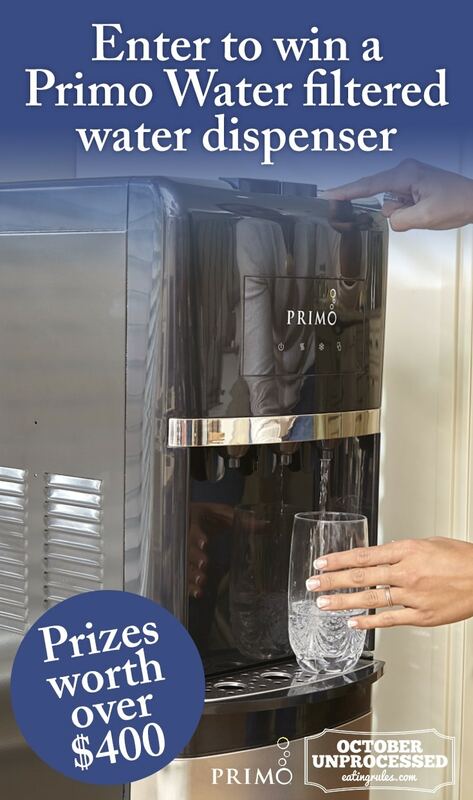 One lucky winner will receive a Primo Hot & Cold Bottom Loading water dispenser (plus two 5-gallon water jug coupons to get you started). By putting the jug at the bottom (instead of the old-school top-loading dispensers), it’s easier to refill — and far more attractive. The dispenser sells for $199.99, and the reusable jugs for $13.44, so the grand prize total value is over $225! 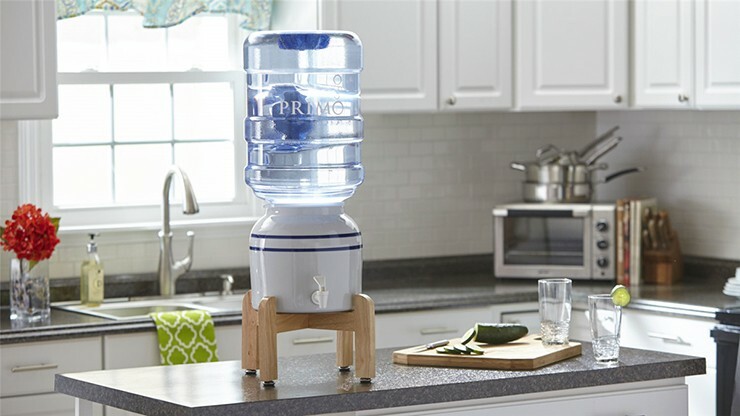 Three lucky winners will receive a Primo Countertop Ceramic Water Crock Dispenser (plus two 5-gallon water jug coupons). They’re attractive, don’t need to be plugged in, and especially handy if you don’t have enough floorspace for a freestanding dispenser. The ceramic dispenser sells for $39.99, and the reusable jugs for $13.44, so each of these prizes is worth over $66! Start by taking the October Unprocessed pledge if you haven’t already. Then, use the Rafflecopter widget below to enter the drawing. After that, you’ll be able to get bonus entries by following the steps in the widget. The Giveaway is open to residents of the U.S. and Canada… and ends at 11:59pm Pacific on Tuesday, October 10. Good luck! good pure drinking water is so important! Everyone deserves clean drinking water. We rely on filters and filtered pitchers, which can get cumbersome and hard to replace routinely. This would be great for us! We like to host big gatherings where we always try to reduce waste, but often end up resorting to plastic water bottles for large crowds. 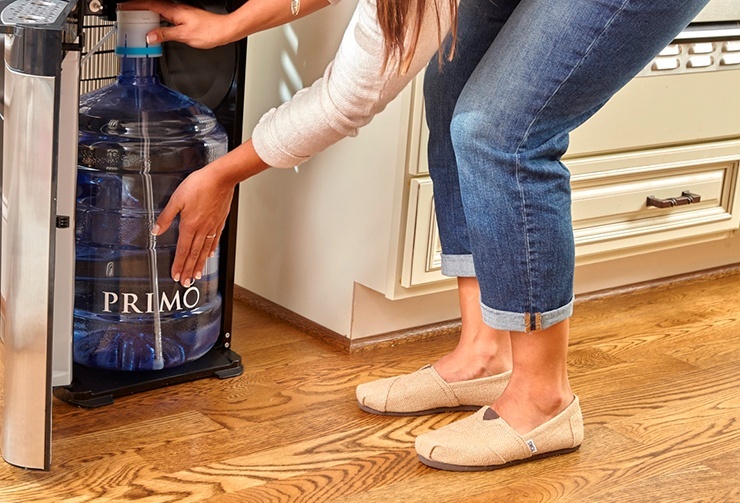 It would be great to have a Primo on display and encourage guests to bring their refillable bottles! 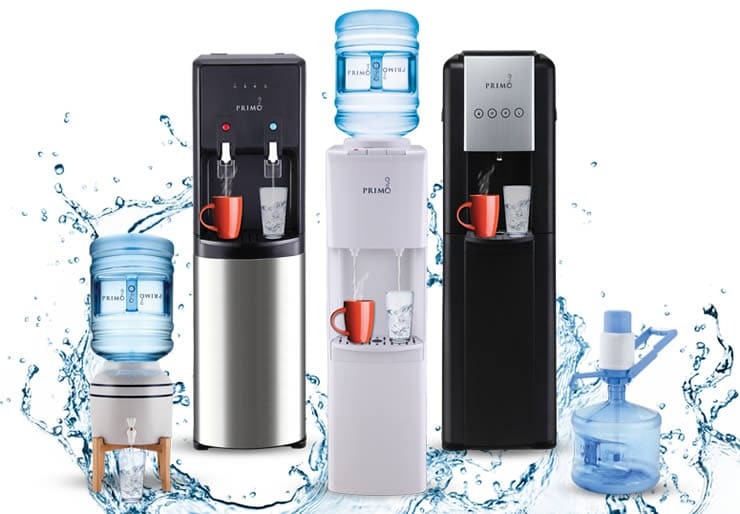 I drink so much water throughout the day that it would be a huge blessing to have a great dispenser like this.